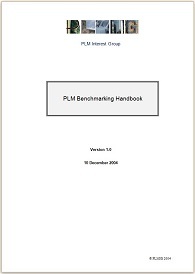 The Handbook and its supporting toolset contain a neutral methodology to quantify the costs, benefits and commercial value of implementing PLM. The toolset enables you to prove to the Board that PLM is worth doing for purely financial reasons. A purchase form can be requested via plm_justification@plmig.com. The PLM Delivery Handbook takes the PLM Justification to a new level, enabling vendors and advisors to collaborate in the process and commit to achieving the results. The fact that all parties have calculated the target benefits and can endorse them is a major boost to project success. A purchase form can be requested via plm_delivery@plmig.com. The PLM Governance Standard enables the Board of a company to ensure that there is an effective management and governance structure for PLM, that enables the Board to fulfil its role in directing PLM activities. A purchase form can be requested via standards_purchase@plmig.com. 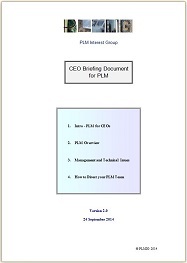 The CEO Briefing Document for PLM is a specialist tool for educating senior directors and VPs about the PLM context. The Document provides a rapid, tailored explanation of the relevance of PLM to the business, increasing the impact of your presentation or project submission. The Handbook and its supporting toolset contain the definitive, neutral methodology for best practice in PLM-ERP integration. The approach is based on 'PLMuERP' - the 'Union' of PLM and ERP - that builds an optimised product management operation across the whole lifecycle. A purchase form can be requested via plmerp_purchase@plmig.com. 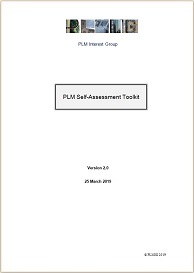 This set of three tools enables the PLM Team to carry out a detailed, quantitative evaluation and comparison of PLM development within the company; and also of the whole implementation with that of a partner organisation. Carry out an internal comparison of different parts of the PLM implementation, or conduct a comprehensive, high-level assessment of the entire PLM setup. Benchmark your PLM performance to position it against that of other companies. Conduct PLM benchmarks, internally or with external partners, at any desired level. Assess the maturity of a PLM implementation. Reveal the 'Full Maturity' future state and the roadmaps of how to get there. These three tools can be purchased as a set for 1000 / £900 / $1050. A purchase form can be requested via toolset_purchase@plmig.com. In 2005 a PLMIG Workshop in Gothenburg produced this Guidebook explaining the theory and methodology of managing data for products that contain both hardware and software. Even though 'SCM' is now known as 'ALM', the logic is still accurate, practical and effective. A purchase form can be requested via plmscm_purchase@plmig.com. is available for 275 (or £250, $300). A purchase form can be requested via plmj_purchase@plmig.com.